North Carolina chef and PBS star Vivian Howard is raising money to help those affected by Hurricane Florence. 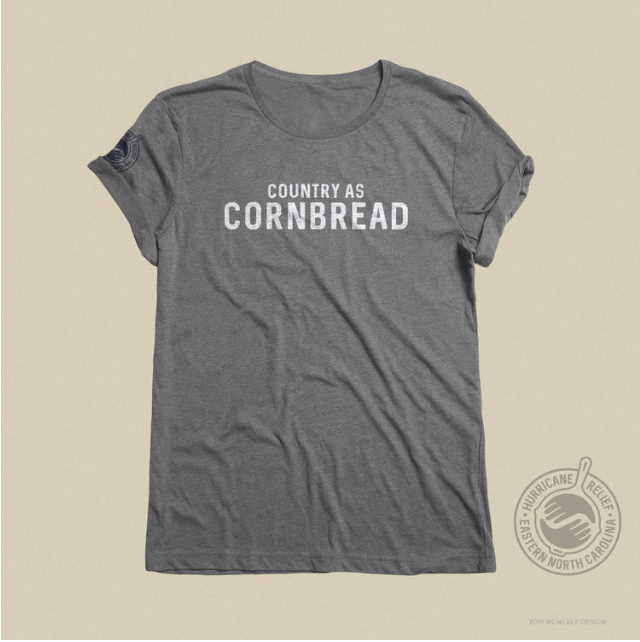 Howard, host of the award-winning PBS show, “A Chef’s Life,” is selling a super soft gray short sleeve shirt emblazoned with the saying “Country as Cornbread” (pictured below) on her website benefit those affected by Hurricane Florence in Jones County. The category one hurricane dumped as much as 30 inches of water on eastern North Carolina. It caused extensive flooding in 27 counties, killed 39 people and left 80,000 people without power and sent 20,000 people to shelters at its peak, according to state officials. The region was still recovering from Hurricane Matthew, a category one storm that caused extensive flooding in the fall of 2016. Each t-shirt costs $25 plus shipping. The shirts go on sale at noon Oct. 7 and will be available for order until midnight Oct. 31. Proceeds will be donated to the North Carolina Community Foundation’s Disaster Relief Fund to benefit Jones County residents. Howard started the fundraiser after hearing Jennifer Tolle Whiteside, CEO and president of the N.C. Community Foundation, speak at a Hurricane Florence fundraising event in Raleigh about the devastation in Jones County. The rural county of about 10,200 people is next to Lenoir County where Howard lives and owns two restaurants, Chef and the Farmer and Boiler Room . Jones County manager Franky Howard said up to 19 inches of rain fell on the county, causing creeks, ponds and the Trent River to rise. The county manager said flooding was so bad in Trenton, Pollocksville and elsewhere in the county that it was as much as five feet higher than records set by Hurricane Floyd in 1999. Assessments, so far, indicate about 600 homes were damaged, affecting up to 15 percent of the population, he said. With limited rental properties and no hotels in the county, the county manager said residents are struggling with repairs to make their homes habitable or to find accommodations until their homes can be fixed. Vivian Howard chose to direct the proceeds to Jones County via the N.C. Community Foundation’s Disaster Relief Fund, where all funds raised go directly to nonprofit organizations serving needs in the impacted areas. No portion of the funds raised are used for the foundation’s administrative or operational expenses. The foundation’s local affiliate leaders direct the fund’s grants to mid- to long-term recovery efforts and unmet needs in the affected communities.